Teabag are very happy to announce that the fantastic new website for the lovely team at Cipher Surgical is now live! 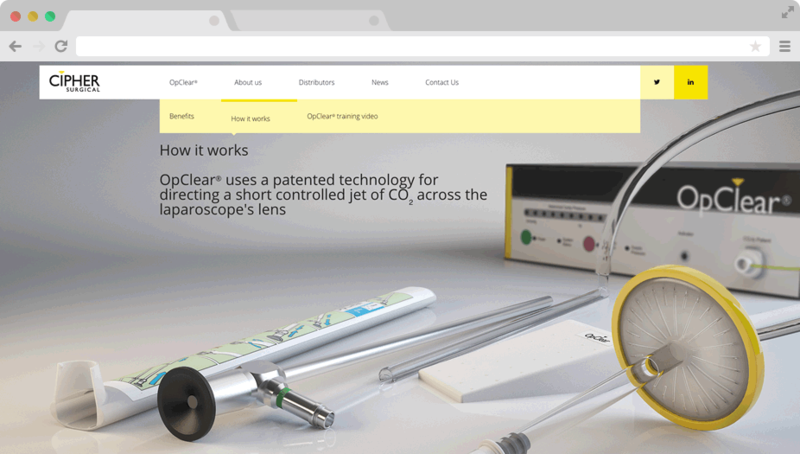 The brief was to create a digital experience that would showcase the product as an innovative and high quality piece of medical equipment. The key objective for the new responsive website was to make it easy to understand and help nurses and support staff to be aware of the features and benefits that OpClear has to offer. Teabag also created high quality 3d visualisations of the product which were used throughout the site to showcase the equipment (below). To support the new website Teabag have also created an animated product video which act’s as both an informative sales video and an instructional piece for equipment users. Sales and Marketing Director, Tony King said “As a medical device company supporting clinical staff with high quality products we wanted to present this image to our customers via our new website. The team at Teabag have been immensely engaging in developing our site and supporting materials adding a young vibrant interpretation to the original brief.